Due to miles of deep sand, this site is best accessed via experienced drivers in particular 4WD vehicles, in a workshop or with a guide service. Most of the services accessing this site seem to do so in an older generation pre-2007 Chevy Suburban, when they had limited slip differentials and a front transfer case including 4WD Low gearing. I saw the clouds moving so I knew a long exposures would be best. Fortunately it was pretty deep into twilight, so I was able to use a circular polarizer as a 2-stop ND filter to lengthen exposure, cut glare from sand crystals in the rock to get the full color (make the clouds pop a bit), and combine 8, 15 and 30-second exposures in Photomatix HDR software to fully extract rock texture (while blending in in the longest exposure to preserve the cloud movement and not have too much of an "HDR-look"). The f-stop ended up being f/8 and I had to raise the ISO to 640 by this point, but at 16mm there was more than enough depth of field, and the noise wasn't bad after I knocked it down a bit more on the underexposed and 0EV images. 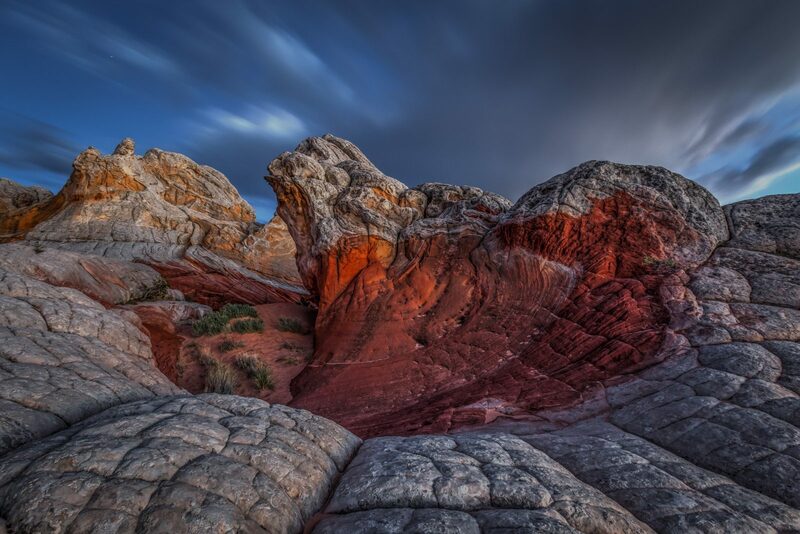 I've made many visits to the Grand Staircase-Escalante, Coyote Buttes, Vermilion Cliffs area over the years, but this was my first visit to White Pocket, Arizona.